This entry was posted on April 30, 2018 by Zoe Thomas. By the year 2020 half of the UK workforce will be carrying out their jobs remotely, according to experts. With the rise of agile working we're going to see a lot more people typing away on laptops and tablets in cafes, conference centres, trains, planes and hotel lobbies over the coming years. While this new-found freedom will no doubt be embraced by office workers bored of a life surrounded by photocopiers and water coolers, it's also going to be welcome news for fraudsters. Visual hacking, sometimes called shoulder surfing, is when a person views confidential information on someone else's screen. If you've ever sat next to someone using a tech device on a train you'll know how easy it is to snoop on what they're doing. It's only natural to be drawn to glowing, moving objects - in fact sometimes it can be hard not to look. Most of the time visual hacking is as innocent as that: someone feeling curious on a long journey. While this can be mildly annoying when you're trying to concentrate on your work, occasionally the consequences can be far more sinister than mild annoyance. In one study, a penetration testing specialist was sent undercover to eight US-based companies, posing as a temp worker. His real mission was to visually hack sensitive data by looking at people's screens and taking photos with his phone. For each attempt he managed to obtain an average of five pieces of confidential information, including customer details, financial data, contact lists, log-ins and employee information. This was all in the 'secure' environment of an office. The potential for visual hacking in public spaces is, of course, much greater. Out in the open it's not just your colleagues looking over your shoulder. Agile working is undoubtedly taking off, and with this transformation comes new risks - not only to the physical health and safety of our staff (which we're used to talking about at Posturite) but also to the security of our data. You can invest as much as you like in malware, cloud applications and security software but that's not going to stop someone looking over an employee's shoulder in a cafe. A privacy filter is a thin film you can place over the screen of your device to prevent the people around you from seeing what you're up to. How do privacy filters work? Privacy filters work in the same way window blinds work - in that the slats allow you to see through the window from one angle, while obscuring the view from another - just on a much smaller scale. How do I choose the right privacy filter? 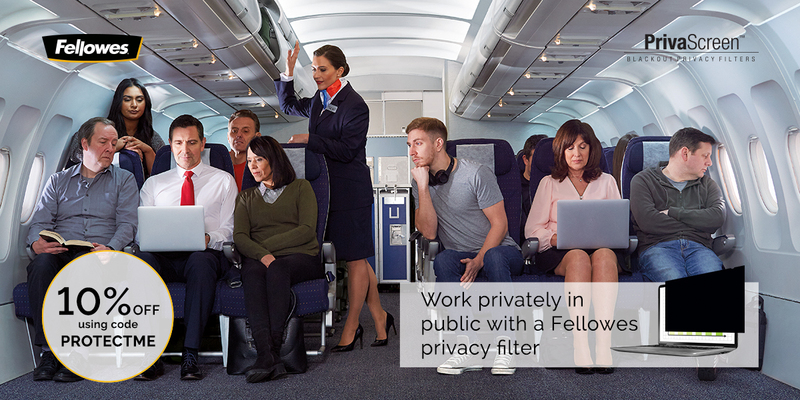 We've recently added the Fellowes collection of PrivaScreen privacy filters to our website. These come with a handy tool you can use to find the right sized privacy filter for your device, whether it's a laptop or a full-sized monitor.